Review: For his classmates Katsuragi is only a game obsessed nerd, but on the Internet he is known as the “God of Conquest”; the one man who can conquer all the girls. Or rather all the 2D girls in dating-sim games that is. Yet that is what the demon girl Elci didn’t understand when she formed a contract with him. It’s her mission to catch escaped souls that hide in girl’s hearts and can only be drawn out when that girl falls in love. Even though Katsuragi has no interest in the real world, he is now forced to conquer the hearts of girl after girl for Elci while using his not always very helpful game knowledge. 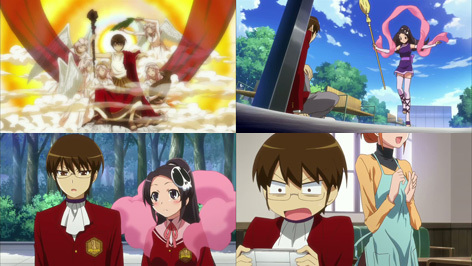 The World God Only Knows is based on a long running comedy manga and portrays how an otaku tries to use knowledge from fiction to conquer real girls. The funny and entertaining concept is a little weakened by flashy childish fantasy animations. However, it is a comedy anime after all and if you don’t try to take it too serious, it’s pretty entertaining. Indeed. 12 episodes are not enough to cover more than 100 manga chapters. Companies these days seem to think its safer to first check the success with a small series, and then consider making sequels. I CAN’T WAIT ANYMORE FOR WATCH THIS ANIME >.< !! i disagree.. this anime is very entertaining and the story is well written and can be a anime that has numerous seasons without its entertainment getting dull. For anime lovers i highly recommend this series. Is there a third season of this anime? horrible anime, the ending just encourages people to think that its ok to make video games your life….pretty sure he died form exhaustion at the very end. Funniest anime ive seen to do with games its so funny i LUV it!!!! Cant get enough of it!! excited for the Season 3 !!! when a month season 3 coming??? and who’s girls in season3?? yeah..diz anime is one of a kind that will make ur happy all day long.. I haven’t watch it yet but all these comments got me excited so I will go check it out now….